Hi Friends, I am back from my fantastic India trip. Visited the not so cold Mumbai and the very cold Delhi and enjoyed every second. But no thanks to the bad internet connectivity during travel I am bringing to you all a belated Shack Saturdays. But, but, but today what I have is one of my favvvourite recipes ‘Paneer Paratha’ which is a variety of Indian Flat Bread made with whole wheat flour and stuffed with Paneer (Cottage Cheese). It goes wonderfully with natural yogurt, salted butter or any kind of pickle. 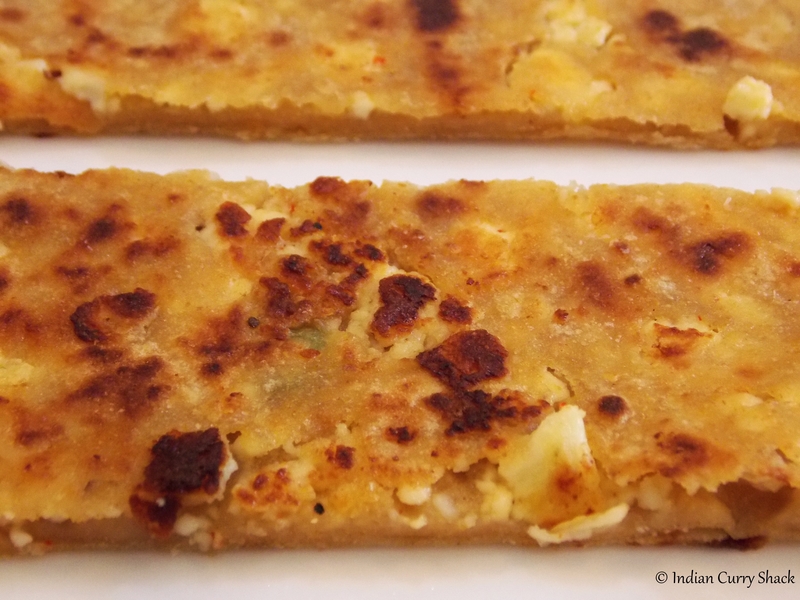 After making the parathas, I cut them into strips and relished each strip even more. You can serve these for breakfast, main-course or even in lunch-boxes. To make the dough – Take Whole Wheat Flour (Aata) in a deep bowl. Add 1/2 teaspoon salt and 1 tablespoon Clarified Butter (Ghee) or Refined Cooking Oil. Add water little by little and knead into a semi-soft dough (it should be elastic and not sticky). Let it rest for 15-20 minutes. In the mean-while you make the Paneer (Cottage Cheese) Stuffing. In a bowl, mix grated/crushed paneer with chopped onions, chopped green chillies, chopped coriander/cilantro, ajwain (carrom seeds), red chilli powder (optional) and salt to taste. Keep aside. Take one dough ball, flatten it by pressing it between your palms or against roti making board (chakla) and coat it with dry whole wheat flour (dry flour coating will prevent it from sticking to rolling pin and board). Roll each part to a small roti using the rolling pin (4-5 inch diameter circle). Add about 2 tablespoons of paneer stuffing in the middle. Now gather the edges of the paratha and bring them together, pinching to seal the paratha. Coat with some dry whole wheat flour. Heat a griddle (tava) and cook the paratha over medium heat on both the sides, using a little ghee or refined oil, till brown spots appear on both the sides. It may be required to flip 1 to 3 times to cook properly. Transfer the parathas to a plate and enjoy with natural yogurt, salted butter or pickles. Love paratha bread! Always have a package of frozen ones in my freezer for sudden craving attacks 😀 But maybe I’ll try making them myself one of these days. Thanks for sharing the recipe! I would love to try a bite!